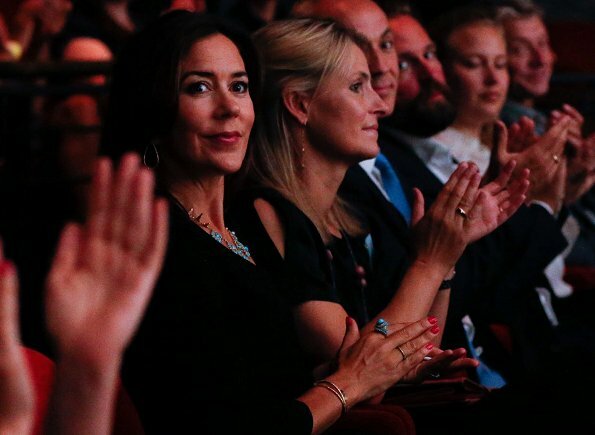 In the evening of August 16, Crown Princess Mary of Denmark attended the opening of Copenhagen TV Festival 2017 (CPH TV Festival 2017) at Royal Danish Playhouse (Danish: Skuespilhuset) in Copenhagen. 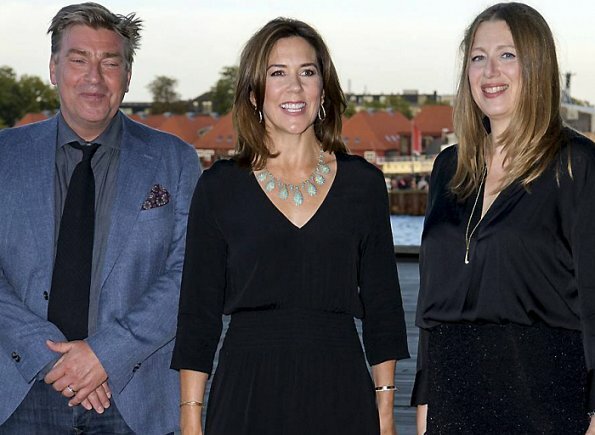 Copenhagen TV Festival is organised by the Danish Producers' Association in cooperation with Danish TV broadcasters. Interesting necklace, I have not seen that before. Could that be worn as tiara maybe? QP M works very hard compared to her husband, it seems. Maybe he does a lot away from public eyes? I don't think this blogg covers the princes work. The swedish princes does a lot of representation that is not show hete. Looking good - love the necklace. The contrast with the simple dress is great. Mary is a busy lady! I think that I have seen this necklace worn by Queen Margarethe in the past. It suits Mary well. No, Margarethe has plenty of turquoise jewels but not this one. Also Queen Margarethe does not tend to lend her jewels to anybody (exceptions Marie´s tiara after big disaster giving Alexandra old tiara as personal fortune and once she lent tiara to Benedicte´s daughter). Turquoise necklace is very becoming to Mary. It looks rather delicate and also old in my eyes. Edwardian period? Maybe Mary has been again shopping in auctions and it is old convertible tiara necklace. I hope! 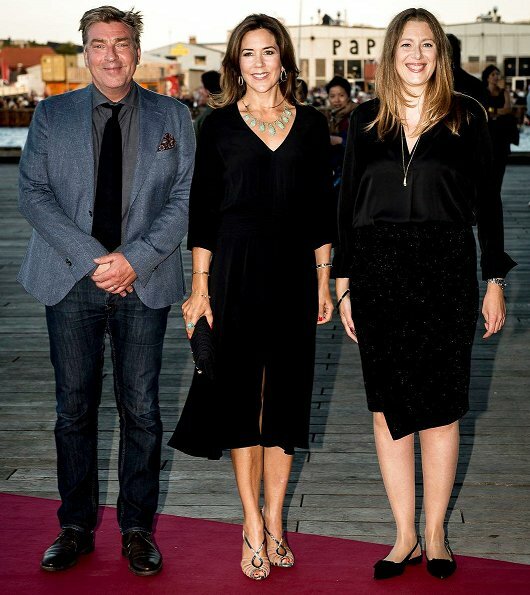 LBD, lovely chain, highheels - easy chic and yet fashionable - well done! Does one know the designer of the dress? Black dress is suitable to evening event.It works excellent with blue stones.Shoes is so fabulous. Effortless and appropriate, knockout look. I really enjoyed seeing the reactions of people when they are interacting with CPM, she seems very engaging and great at putting people at ease, what an amazing skill. Lovely! Love the whole look, the dress, the pretty necklace and the gorgeous shoes.